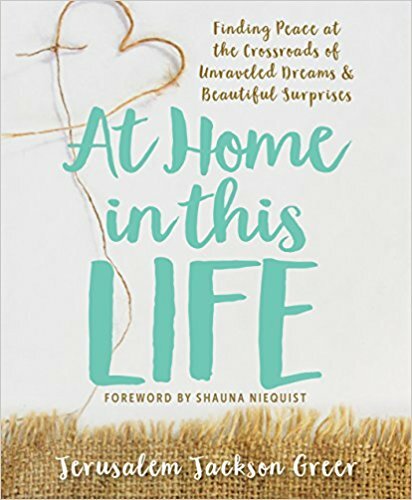 Today we celebrate the official launch of At Home in This Life, a new book from Grow Christians author Jerusalem Jackson Greer. This is Jerusalem’s second book; her first, A Homemade Year, focused on crafts to celebrate the liturgical year at home. Maybe you’ve already been reading Jerusalem, since she wrote Forward Day by Day‘s May meditations. The video below is an excerpt of her Forward Day by Day interview with series editor Rachel Jones (also a Grow Christians author). Rachel is on the left; Jerusalem on the right. There are many reasons to love books, but chief among them is when a book makes you feel you’ve found a new friend. Jerusalem is so honest about her struggles, her joys, and her journey that after I finished At Home in This Life, I wanted to have her over to my house. Since she lives in Arkansas and I live in Michigan, this won’t be possible. All I can do is recommend you find her virtual friendship too: by reading the excerpt below, by buying her book or by entering to win it through our giveaway (details below). Growing up an evangelical child of the 1980s, I struggled for years to have appropriate and intentional “quiet time.” I tried fill-in-the-blank Bible studies and fervent prayers modeled after the evangelist I saw during revival season. I locked myself in closets, trekked out to lone tree stumps in the forest, and journaled in comfortable chairs by well-lit windows. I knelt, I stood, I lay prostrate. I tried when I woke up, I tried before I went to bed. But mostly during all of these quiet-time experiments, I fell asleep or felt bored, my mind wandering hither, thither, and yon. Of course, since I was a good Christian girl, my failure led to feelings of guilt (I must not love Jesus enough) and then resignation (I must not be wired to pray well). The funny thing is this: I was always praying, my days filled with a sort of constant conversation with God, as if God were a sort of imaginary—yet totally real—friend resting on my shoulder. It would be decades before I understood this as a legitimate way to pray—a way other people prayed as well—advocated most strongly by that quirky, dishwashing Carmelite, Brother Lawrence. But in my quest for silence, I knew I needed a more intentional way to pray. I craved the sort of richness and depth that comes from having a multitude of prayer practices. The time had come to embrace the practice of silent prayer. Just as prayer goes two ways, so does silence. We must learn to both give and receive. We must choose to go quiet ourselves, and then to allow the quietude of the Holy Spirit to come and fill in the space we have made, filling our hearts with a rest and a peace we cannot access any other way. Being a novice at silence, both practicing and receiving, I thought it would be helpful to have a tactile project, to help me resist the urge to fall asleep or wander in my thoughts. A project to pick up and work on when I begin to feel the anxiety of too much noise, too much commotion, and too much chatter and buzzing all around me. A project to keep my hands busy while I quiet my mind and move into my heart. Like the ADHD students I love and work with at school, I needed a fidget tool to keep my energy occupied, freeing my mind to take its time connecting to my heart, to my breath, to my inner listening ear. Inspired by beautiful Tibetan prayer flags I had seen on the front porches of neighborhood houses, I decided I would create my own prayer flags. Traditionally, Tibetan prayer flags are hung or staked outside a Buddhist home to promote peace, compassion, strength, and wisdom, reminding those inside and outside the home to re-center their lives on these virtues. In desperate need myself of all those lessons (and more), I wanted to create flags we could hang in our home, flags that would serve as visual reminders of what we are to pray for, and as a visual blessing over our home and all those who entered. I gathered scraps of fabric, loose buttons, embroidery thread, and lace. I chose words for our flags: Compassion, Stillness, Peace, Mercy, Kindness, Love, Hope. And as a magpie begins to build her nest, so I began my practice of praying through silence, one little scrap at a time. I practiced in doctor’s offices and airport terminals, at family reunions, alone on my back porch, and sitting next to my kids while they watched Dr. Who. I practiced alone as much as possible, and when not possible, I practiced in the middle of chaos. I practiced on road trips, on vacations, and late at night in bed. During these times of stitching I rarely spoke; instead, I practiced being and receiving, sometimes saying, “Come, Lord Jesus, come,” as I threaded my needle and applied the first stitch. Want to read more? 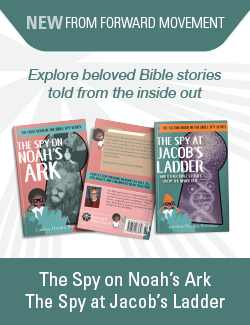 You can buy the book direct from the publisher or on Amazon (neither are affiliate links). And you can enter our giveaway! Paraclete Press is partnering with us to give two (2) copies of the book away. They will go to two different people. This is a simple drawing to enter! Just go over to our Facebook page. Make sure you “like” Grow Christians. Then comment on the Facebook post announcing this giveaway. Let us know if you’ve read Jerusalem Greer elsewhere (on Grow Christians, her own blog, Forward Day by Day) or if this book would be your first opportunity! This giveaway will close Tuesday morning, May 30, at 7am, at which time two winners will be selected at random and contacted through Facebook Messenger. Winners have 48 hours to claim their prize by providing an email and postal mail address. Once all prizes have been claimed, the Facebook post and this post announcing the giveaway will be updated to reflect that the giveaway has closed. Do you pray while crafting? Craft while praying?